Like Tahiya Carioca, Umm Kulthoum or indeed La Niña de los Peines, the world-renowned Oriental dancer and dance teacher Morocco has about her the indelible mark of a diva — strong willed, courageous and earthy. Her statements are made with an authority that springs as much from an inborn self-confidence as from the profound and wide-ranging experience to which it became subject. She has performed with her own troupe at, among other prestigious venues, the Lincoln Center; and has more recently used the questions-and-answers sessions as an opportunity to inform Westerners about Eastern culture: “I will open my mouth to speak as long as I go on living.” Unassuming in appearance and profoundly generous of heart, she needs neither the flash-in-the-pan demeanour of many a contemporary performance artist nor the ladylike airs of her generation of women. Style is a word she would much rather apply to the physical language she enjoys speaking — that of dance — and into which her insights are so subtle they are likely to outdo those of even the most seasoned home-grown experts. For though a Roma gypsy of many tongues, a streetwise New Yorker and, perhaps more importantly, a well-rounded citizen of the world, Morocco remains, by birth, a cultural-geographical outsider to her vocation. 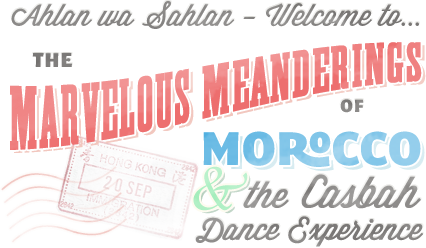 Yet like newcomers to a language, Morocco has come to understand Oriental dance better and more precisely than its native speakers. 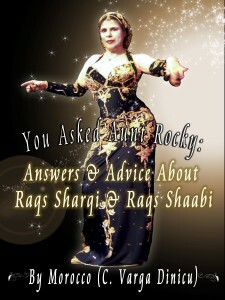 “We’re going back a long way,” she says when I ask about her connection with Oriental dance, the correct translation of raqs sharqi, “and it was by accident.” Morocco makes a point of distinguishing between raqs sharqi and “belly dance”, the latter being “an insulting misnomer used by a man named Sol Bloom, in 1893”, who sought to promote his sensational shows using exotic, out-of-the-ordinary terminology. “I was a concert Flamenco dancer with the Ballet Español Ximenez Vargas,” she begins, spinning a fascinating yarn of 1960 New York involving a Greek Orthodox priest particularly friendly with dancers, a Lebanese-Greek nightclub owner with a heavy accent, the long standing phonetic confusion between ballet and belly, and the need for a job — “to eat”. As it turns out — and in more than an hour of Morocco speaking, there is not a moment of boredom or unpleasantness — this was a relatively late point in the course of her career. As a Spanish major enamoured of the culture, she encountered, at a party of the Spanish club she belonged to, an eight- or nine-year-old girl who could work miracles “with castanettes and a long dress with ruffles”. Teaching started almost as soon as practising, because it was a relatively easy way to make money and to promote a relatively new art form, especially since “at that time in New York restaurants and clubs, if you were a good girl, nobody bothered you”; it was, in other words, “very protected”. Starting in 1961, she was teaching regular classes almost continually; she did not open her own school until 1976, but since 1965, “I was teaching in somebody else’s school and I was teaching at a university”. She says she can’t compare Flamenco to Sharqi because “it’s kind of like Cajun French in New Orleans; the French people who settled there in 1500s and the 1600s speak a very different language from Parisian French. At one moment the language froze and went one way, whereas in France it went a whole other way. Flamenco came from the Moors, but because Ferdinand and Isabella threw out first the Arabs and then the Jews in 1491 and 1492, what was there of the dance froze and went in a different direction. 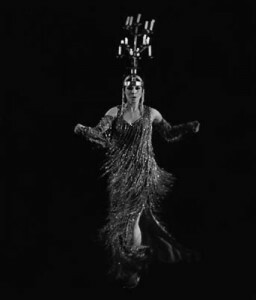 Also it came from the Houara, which is not sharqi ; although if you see zambra mora — in Moroccan Arabic zambra means hafla, a party — it looks more like sharqi but it isn’t, because it went another way.” Gradually, over many years, Morocco found “all the basic slow movements and of course all the different hip variations, and I use them as a different vocabulary, like you learn the letters of the alphabet”. It was a slow process of inventing formal structures for a body of knowledge that had hitherto only ever been intuitively assimilated. On that fateful evening, in December 1960 — going, in the company of her guitarist, under the illusion that she was to offer her usual Flamenco performances — she eventually discovered that what was required was something else entirely; again, a form of dance she had never encountered in her life — and one to which she was drawn with equal force. The dancer who was then performing, she recalls, was vastly inadequate. “If I can’t do better than that,” she decided, I wouldn’t be worth my salt. 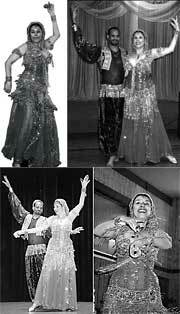 And so, from her first, vague attempt at copying what she had just seen, in that dancer’s ill-fitting costume, through night after night of close observation and participation, whether playing the tabla or the sagat (“I am the best sagat player,” Morocco says), to finding her way into the homes of the club’s patrons and other Middle Easterners and North Africans, she acquired astounding knowledge and skill. 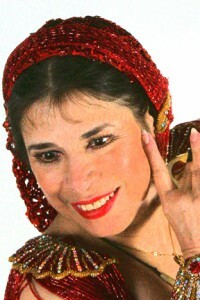 This was, she later realised, the beginning of the final step on a life-long journey which, starting in European dance, moved south to the Berber traditions from which Flamenco first emerged, then east to the Arab connection, the single most significant factor in the formation of what is generally referred to as Moorish culture, that Berber-Arab amalgam that was to oversee the artistic golden age of southern Spain, from whence to Asia Minor. “I didn’t realise it then, but I was going back to the roots of Flamenco. If you read in history, Roman generals who were in Iberia during the Pax Romana wrote about the dancing girls who were doing what sounds like sharqi, from the way they describe it.” It sounds like a roundabout homecoming. Different families gave her different versions of the same story, however — the traditions, customs, styles of movement, rhythms, occasions on which a particular dance is performed, for how long and to what music — the information was endless, for, notwithstanding some general defining characteristics, under the general umbrella of raqs sharqi lies the almost infinite variety of shaabi, or popular dance. One interesting encounter was with the banat (daughters of) Mazen – Sinti gypsies of Upper Egypt: “In 1978, the man I was married to was a photographer, and he took pictures of Khaireya Mazen and me; we look more like sisters than I look with my own sister, or she does with hers.” Elsewhere she was to develop enormous understanding of these forms. “Because I’m very curious, I wanted to know everything. Which is the true story? And when I started travelling I realised there isn’t one truth. They were all telling me the truth.” And she’s doing so with such passion, she finds herself anachronistic in an age when “Everybody is trying to be like it is somewhere else”.